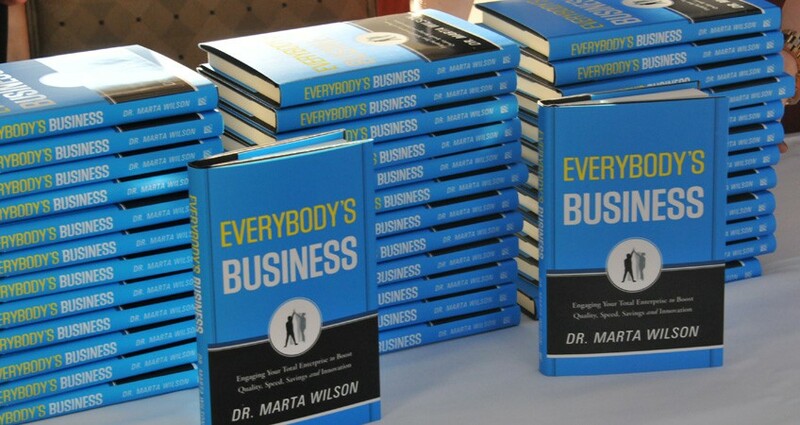 TSI’s new book, Everybody’s Business, available for sale October 9th - Transformation Systems, Inc.
TSI’s new book, Everybody’s Business, will be available in bookstores and electronic format on October 9th. Based on research and practice, it answers the question: How can leaders engage the total enterprise to boost quality, speed, savings and innovation? Industrial and organizational psychologist, Dr. Marta Wilson, and her team of experts at TSI show how leaders in small businesses, large corporations, government agencies, and military organizations have found their best options by asking this recurring question: What is the smallest step with the biggest return? Wilson believes in the power of ask-ing questions and listening—to customers, employees, suppliers, investors—as the best way to improve performance. Leaders must initiate dialog to discover ideas from each stakeholder’s unique vantage point. Guided by TSI’s commitment to corporate social responsibility, TSI’s first-year proceeds from Everybody’s Business book sales will be donated to our strategically selected charities of choice that fight hunger, support veterans, advance STEM education and promote literacy.